Last time I did this volume of cooking I had a sous chef (my mother) running around at my beck and call taking care of a million little details. Things like explaining to me that the reason the whipped cream wasn’t working was because I was trying to make it out of half-and-half. Yup . . . little things like that. Anyway, for the most part this year I was unsupervised in the kitchen and I learned a couple of things. 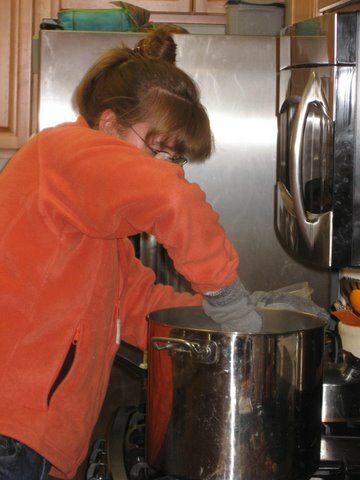 Lesson One: Before steaming one’s upper body over a giant pot of boiling potatoes it is wise to remove one’s fleece jacket. I’m pretty sure no drops of sweat fell in the potatoes. Lesson Two: Every kitchen should have a full on heavy-duty kitchen hot pad mitt thingy. Do you know what it is I am wearing on my hands? He loves mashed potatoes and wasn’t about to let a minor detail like his wife burning herself keep him from getting those potatoes at Thanksgiving dinner. Truth be told I was yelling at him to get me the oven mitt from the camping gear. He informed me that there is no oven mitt in the camping gear and came to my rescue with SmartWool®. Gotta love a man who thinks on his feet. Or about his feet. Which may be why he brought me socks. To all of those who ate the potatoes, I promise the socks were clean. The mashed potatoes turned out just fine . . . so I’m told by those people who aren’t allergic to dairy products and actually got to eat them. How can a recipe containing cream cheese and butter possibly be bad? I know because I used to imbibe . . . heavily . . . sigh . . . give me a minute . . . I’m need to pause to reminisce about dairy product consumption . . . mmmmmmm . . .
OK . . . I’m back. If you want the mashed potato recipe you can get it from its creator here. When you read it you can do your own calculations but as a highly qualified Parks and Recreation Administration major I’m estimating that there are approximately 3,472 calories per teaspoon. However, since it is always good to look on the bright side I’ll just mention the upside of a milk allergy in this situation . . . I don’t have to work off those mashed potato calories. I’m just sayin’ . . .
G – to his sister – very indignant – eyes wide – voice loud – left arm gesturing across the room – arguing about how smart a specific friend is . . .
I’m waiting for him to blame me next time he loses a toy . . . waiting for him to tell me he couldn’t see it because I haven’t fed him carrots lately. Once upon a time during my teenage years my mother had a HappyThings party. HappyThings was a company that sold fun stuff for your house using the same multi-level direct marketing format as our favorite plastic storage container company. I don’t know if HappyThings still exists – at least not in that form. It does still exist, however, in my little world – much the same way it exists for many others. The term “happy things” stuck with me and now Happy Things are things that make me smile – really smile, over and over again. I have a new Happy Thing in my life and I thought I’d share it with you. makes me very, very happy. 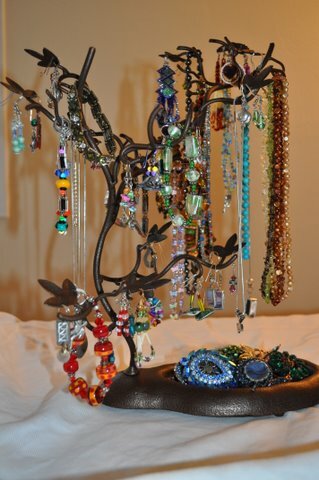 I picked up the jewelry tree at our local giant buy everything in huge quantities store earlier this month. It has been sitting fully loaded on my dresser for several days now and when I walk into my room I’m still surprised that it is there. I still pause and I still smile. It makes me happy on a number of levels. First, it is pretty and colorful and sparkly and shiny and looks like little rays of sunshine. Sunshine in Alaska is precious this time of year. Second, and perhaps most importantly, I can actually see my baubles. (And I do love my baubles.) This means they may all get worn sometime this year . . . no more groping around to find whatever is sitting on top of the pile of who knows what inside my dresser drawer. You see, I am one of those people for whom “out of sight, out of mind” describes my entire mode of functioning. It’s true . . . once when R & G were toddlers and tucked in for afternoon nap I decided I needed to run to the store to grab something for dinner. I had my purse in hand and was headed out the door when it suddenly occurred to me that I had two children who really weren’t quite old enough to be left unattended. Third, picking out my, ahem, jewels for the day . . . (Hmmmm, how shall we accessorize the shredded garage sale jeans and paint stained t-shirt today?) . . . use to be one of the highlights of my day . . . (Little things, people! Little things!) . . . and with this it is becoming a highlight again. And honestly, how can one not be happy gazing at a giant wad of pretty beads? Here’s to my happy little jewelry tree. I hope you have a Happy Thing in your life today.